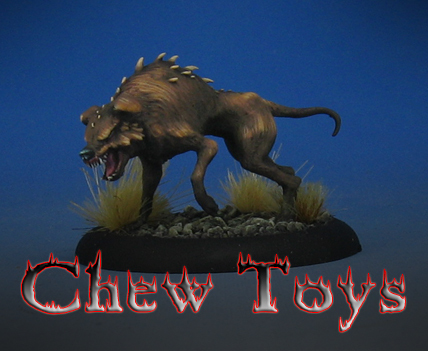 It has been a long time since I have had a chance to paint a Malifaux figure, so this set of hounds was a treat! There were a lot of glazes involved with each one, but on this hound in particular I made sure to include some of the grayish blue glazes that I was using on some of the other hounds that looked more like wolves. By making the highlights a bit more yellow, the grayish blue registered as more greenish to the eye. I am always talking about context in miniature painting, and this is another area. Basically making the eye think it is seeing one color, when it is actually another. This can provide more depth and interest to your figures without having to mix and place endless layers of opaque paint, especially when you also have to deal with a very fine texture such as the fur. It was not very pronounced at all, which meant that I could adjust it by freehand applications in the highlights and shadow areas.